Shotokan (松濤館流 Shōtōkan-ryū) is a style of karate, developed from various martial arts by Gichin Funakoshi (1868–1957) and his son Gigo (Yoshitaka) Funakoshi (1906–1945). Gichin was born in Okinawa and is widely credited with popularizing karate through a series of public demonstrations, and by promoting the development of university karate clubs. Gichin Funakoshi laid out the Twenty Precepts of Karate, (or Niju kun) which form the foundations of the art, before some of his students established the JKA. Within these twenty principles, based heavily on Bushido and Zen, lies the philosophy of Shotokan. The principles allude to notions of humility, respect, compassion, patience, and both an inward and outward calmness. 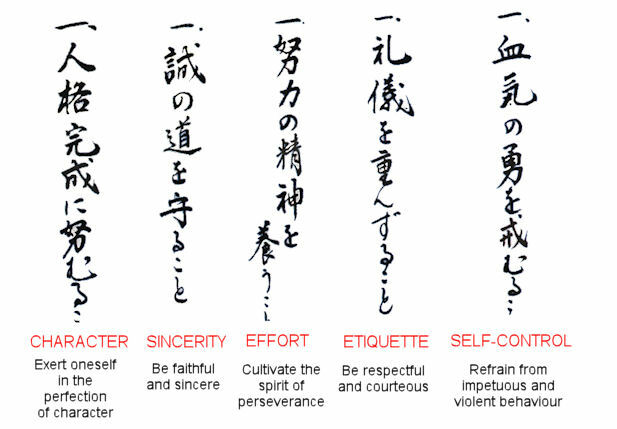 It was Funakoshi’s belief that through karate practice and observation of these 20 principles, the karateka (student) would improve their person. The Dojo kun lists five philosophical rules for training in the dojo; seek perfection of character, be faithful, endeavor to excel, respect others, refrain from violent behaviour. Shotokan training is usually divided into three parts: 1.kihon (basics) 2.kata (forms or patterns of moves) and 3.kumite (sparring). Techniques in kihon and kata are characterized by deep, long stances that provide stability, enable powerful movements, and strengthen the legs. Shotokan is often regarded as a ‘hard’ and ‘external’ martial art because it is taught that way to beginners and coloured belts to develop strong basic techniques and stances. Initially strength and power are demonstrated instead of slower, more flowing motions. Those who progress to brown and black belt level develop a much more fluid style which incorporates grappling and some aikido-like techniques, which can be found in the black belt katas. Kumite techniques mirror these stances and movements at a basic level, but are less structured, with a focus instead on speed and efficiency. Ranks are used in karate to indicate experience, expertise, and to a lesser degree, seniority. As with many martial arts, Shotokan uses a system of colored belts to indicate rank. Most Shotokan schools use the kyū / dan system but have added other belt colours. The order of colours varies widely from school to school, but kyu belts are denoted with colours that in some schools become darker as a student approaches shodan. Dan level belts are invariably black, with some schools using stripes to denote various ranks of black belt. Kihon basics is the practice of basic techniques in Shotokan Karate. Kihon Kata, or Shodan, was developed by Yoshitaka Funakoshi, the son of Gichin Funakoshi, as a basic introduction to karate kata. (Yoshitaka also developed Nidan and Sandan) The kata consists of successive restatements of the theme of gedan barai – oi tsuki. Kumite, or sparring (Meeting of hands), is the practical application of kata to real opponents. While the techniques used in sparring are only slightly different than kihon, the formalities of kumite in Shotokan karate were first instituted by Masatoshi Nakayama wherein basic, intermediate, and advanced sparring techniques and rules were formalised. Free sparring (jiyu kumite) is the last element of sparring to be learned. In this exercise, two training partners are free to use any karate technique or combination of attacks, and the defender at any given moment is free to avoid, block, counter, or attack with any karate technique. Training partners are encouraged to make controlled and focused contact with their opponent, but to withdraw their attack as soon as surface contact has been made. This allows a full range of target areas to be attacked (including punches and kicks to the face, head, throat, and body) with no padding or protective gloves, but maintains a degree of safety for the participants. Throwing one’s partner and performing takedowns are permitted in free sparring, but it is unusual for competition matches to involve extended grappling or ground-wrestling, as Shotokan karateka are encouraged to end an encounter with a single attack (ippon), avoiding extended periods of conflict or unnecessary contact in situations where there is likely to be more than one attacker.